This is a long post. 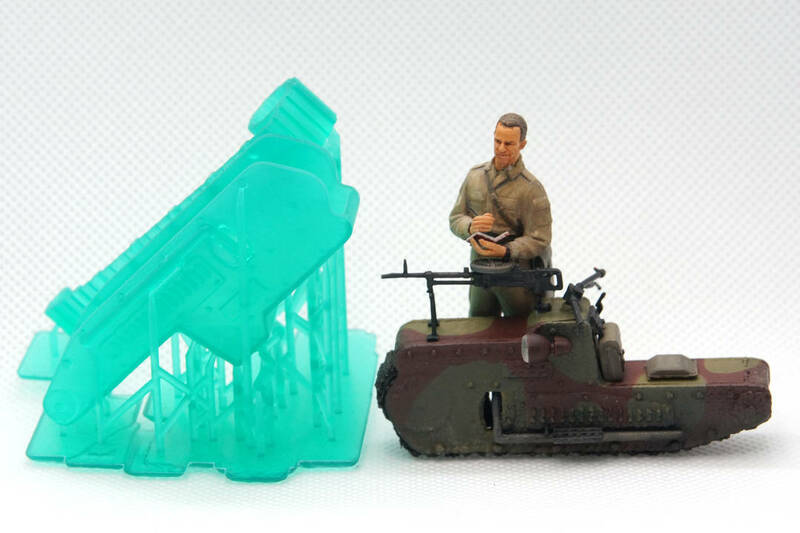 The TL;DR: SLA printing quality is as good or better than Shapeways, it's stinky and messy. Pictures at the bottom. I recently bought an AnyCubic Photon, a Stereolithography (SLA) 3D printer that works by shining UV light through a high resolution mask to cure a liquid resin. If you've seen or used those expensive UV-cure glues, it's roughly the same type of material. Once cured, it's a hard and brittle plastic like most model resin or Shapeways high resolution parts. I also have an FDM (Fused Deposition Modeling) printer that I've use to print models. 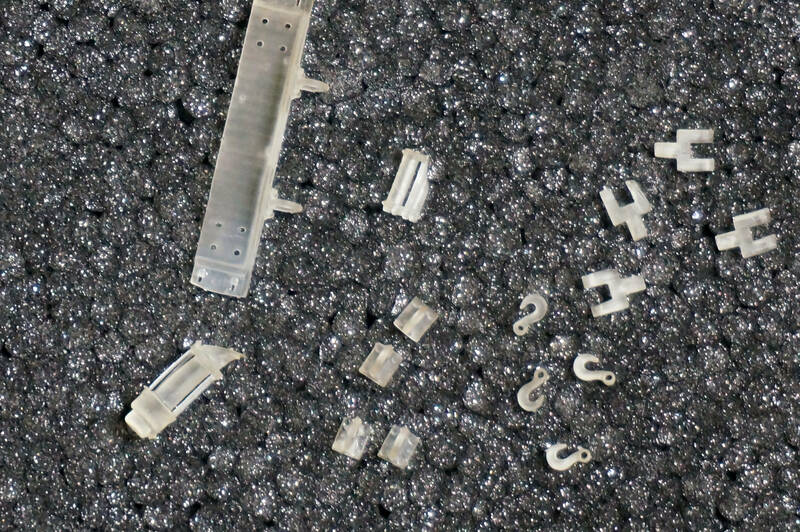 FDM printers commonly use PLA (polylactic acid) or ABS filament, which is heated until it melts and is then extruded layer by layer through a narrow nozzle to build up a three dimensional object. The print time is determined by the time spent by the print head moving in XYZ and by the complexity, resolution and orientation of the model. Each type of printer has its uses, advantages and disadvantages. 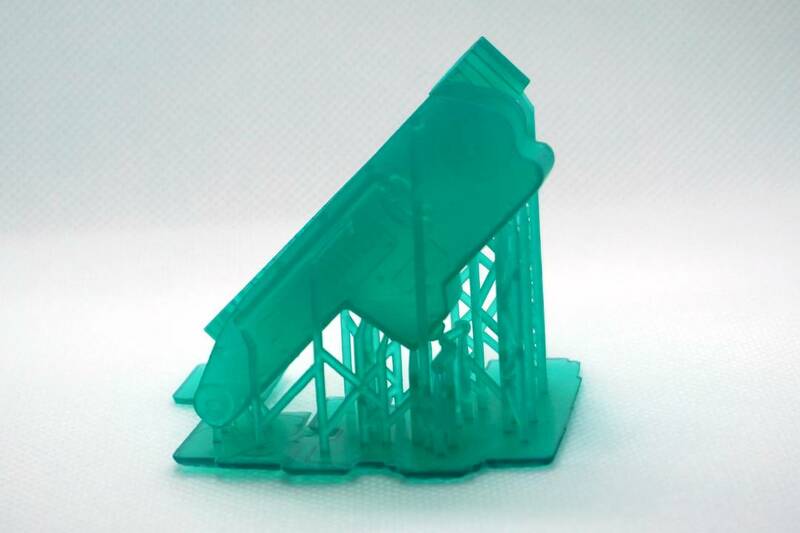 FDM printers can print fairly large objects in a wide range of materials and speeds. 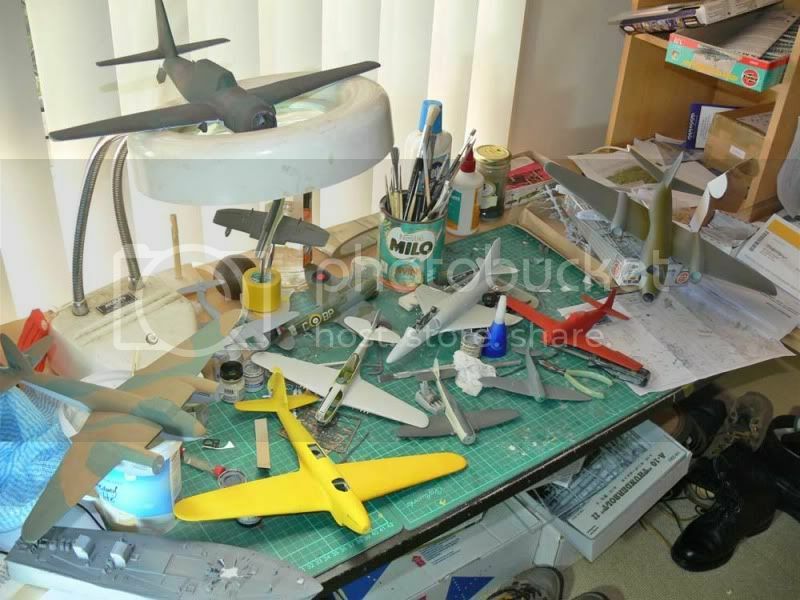 Once printed, the object is ready to go, unless optional post processing steps are needed. FDM printer resolution is limited by several factors, but typically do not print with vertical (Z axis) resolutions smaller than 0.1mm (100 microns or about 0.004"). While this is more than enough resolution for most objects, it's not ideal for small scale models, and the horizontal artifacts created by the print layers can detract from the appearance of the model. There are ways around this - with PLA, you can prime and sand the model until the lines go away or you can buy a special type of PLA that can be bathed in alcohol to remove the print lines. With ABS, you can prime and sand the model or use Acetone or similar solvents to smooth the surface and remove or reduce the artifacts. Both of these methods have the potential to damage or obliterate small details on the model. 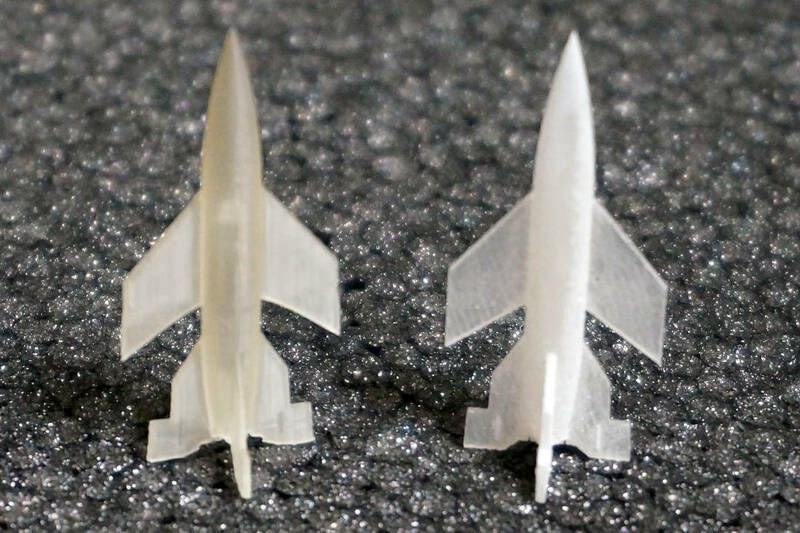 An SLA printer like the AnyCubic Photon or the Sparkmaker are limited in the size of models they can print (the printer's print volume). The Z axis resolution can be 25 - 100 microns, up to 4 times better than an FDM printer (it can be pushed to print 10 micron layers, so 10x better than FDM). The XY resolution is around 40 - 50 microns. 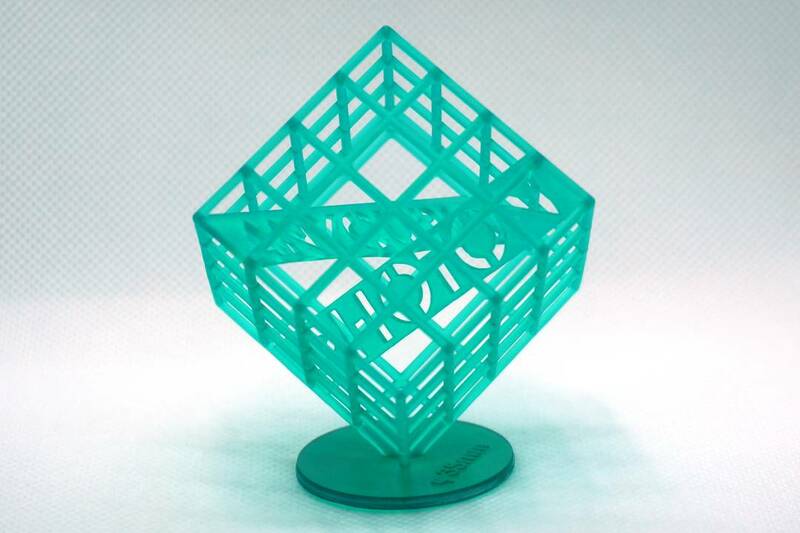 Unlike an FDM printer the print time for an SLA printer is determined by the Z axis resolution and the time required to expose and harden each layer of resin. Printing five copies of the same object (as long as they fit in the build volume) takes just as long as printing one copy. Both types of printers work by slicing a model into many layers. On an FDM printer, the slices determine the path of the print head. In an SLA printer, it defines the mask displayed on the LCD. Clear areas are exposed to UV and harden, dark areas stay liquid. Most consumer SLA printers use an LCD screen to display the slices. This screen is covered by a resin vat. The bottom of the vat has a thin, clear film of FEP (Fluorinated ethylene propylene) which presses against the LCD screen. FEP is used because few materials stick to it. Resin is added to the vat and the print is started. A build plate (aluminum or steel) moves towards the FEP film until it is a layer thickness (50 or 25 microns) away from the film, trapping a thin layer of resin between the two. The LCD screen and UV backlight are turned on, exposing the resin to a cross section of the object. After a few seconds exposure (it varies by resin) the resin has hardened and stuck to the build plate (and hopefully not the FEP). The light is turned off and the build plate moved up to the next layer. This allows more resin to flow in the new space. The process is repeated until the object has been printed. Once the printing has finished, the object will be hanging upside down from the build plate, dripping uncured resin. The print has to be removed from the build plate and the uncured resin removed by washing it in a container of Isopropyl or Denatured (Methylated in some places) Alcohol. After this wash, the alcohol is removed by rinsing the object in water. The resin isn't fully cured at this stage, so the print will be somewhat soft and delicate. Placing the object in sunlight for a few minutes or under a 405nm UV light will fully cure the object and it will be ready to use. 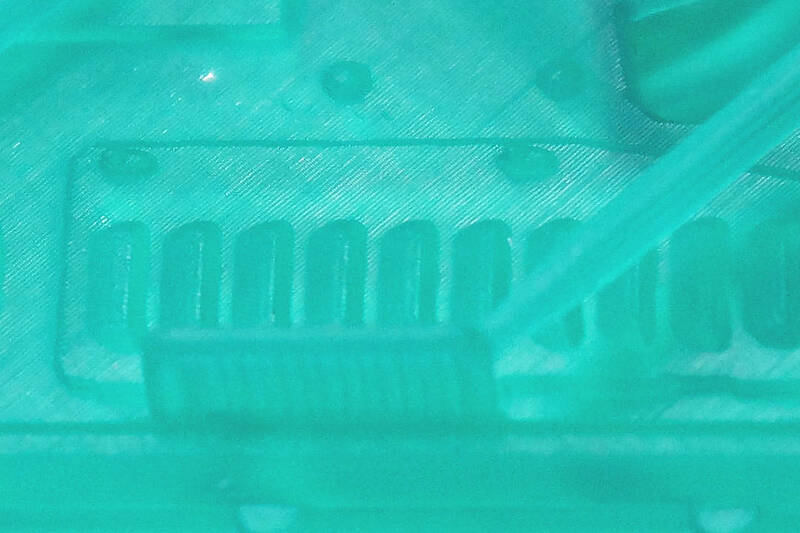 In an FDM printer, the filaments are solid until melted. PLA and especially ABS will have a strong smell while printing, but this is easily mitigated with an enclosure. When the printing is done, the smell is gone and there's little waste material left, unless it's support plastic. 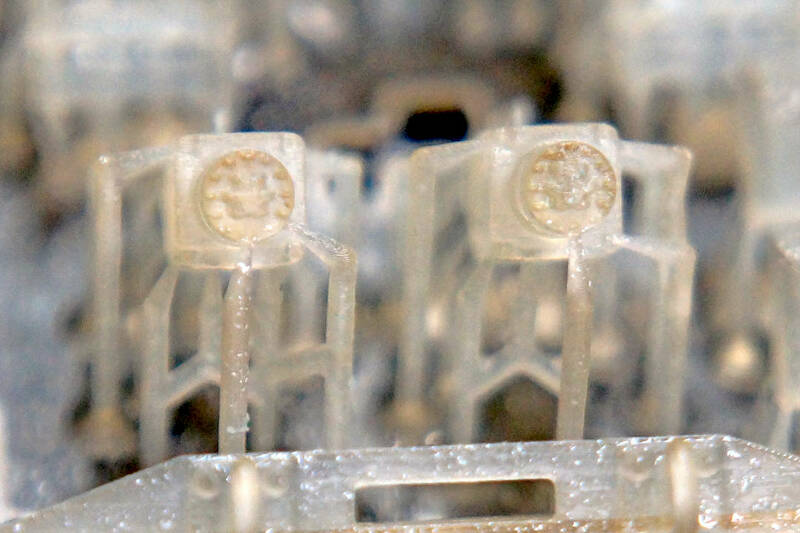 In an SLA printer, the liquid resin is sticky and can be very smelly. Gloves, eye protection and a mask are not just recommended, but required. During printing, the resin smell will be strong, since the AnyCubic (and SparkMaker) do not have good filtering. There are aftermarket solutions that add an activated carbon filter that eliminates the odor, but that's an extra part that has to be added. Once the printing is done, the print has to be removed from the build plate, which will be gooey with uncured resin. This will consume many paper towels. I have a small tray that I use to remove the print from the build plate and keep the resin contained. Washing the print takes alcohol and more paper towels and curing the print will require a UV lamp (I use an LED lamp used to cure fingernail polish). The build plate then has to be cleaned of resin. If you don't plan on printing in the next couple of days, the resin vat has to be emptied and the unused resin filtered (in case there are small bits of cured resin floating in it) and stored in a different container, as to not contaminate the original resin bottle. This resin can be reused, though. The emptied vat has to be cleaned thoroughly (which requires more paper towels and care not to scratch or puncture the FEP film). It's only then that the printing has been completed. There are currently quite a few sub $500 SLA printers on the market; with careful shopping, the AnyCubic Photon can be bought for well under $400 (that's what I did). The Sparkmaker printer is $219 on Amazon. It has roughly the same resolution as the Photon, but a smaller build area. While the AnyCubic Photon comes with 250 ml of resin (about $25 worth), tools, etc. The Sparkmaker doesn't include resin at that price. Other printers include the Wanhao D7 and the Monoprice Mini Deluxe 3D Printer (a rebadged Wanhao D7). 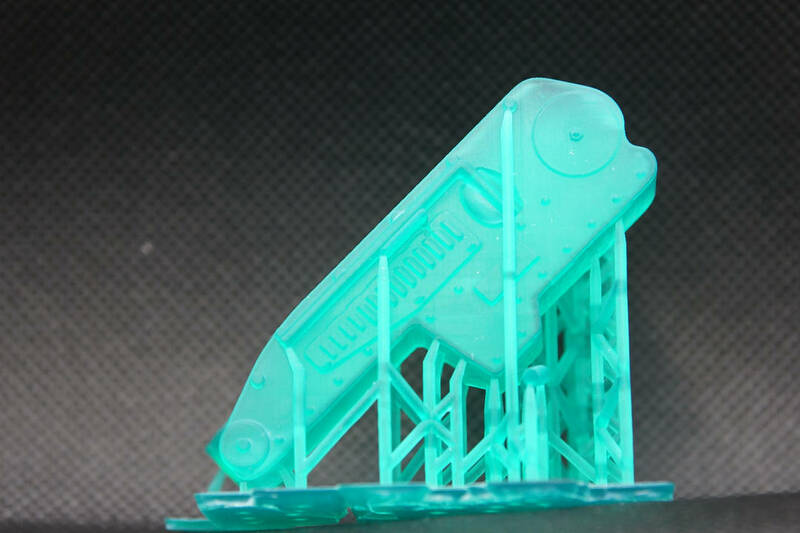 The support structures are needed to keep the part tilted, so uncured resin doesn't pool in the model. The supports will probably get reused as scaffolding on some other model. Note that at 50 microns, the surface finish looks better than Shapeway's best material... there are reasons for this, partly because Shapeways goes for speed and low print quality to maintain their volume. 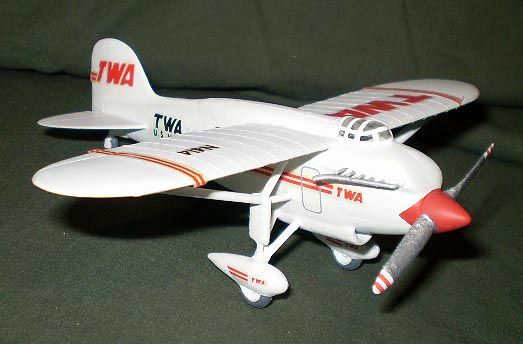 I'll paint this model this weekend; I doubt that the printing artifacts will be very noticeable. Thank you for the excellent review on this 3D printing system. 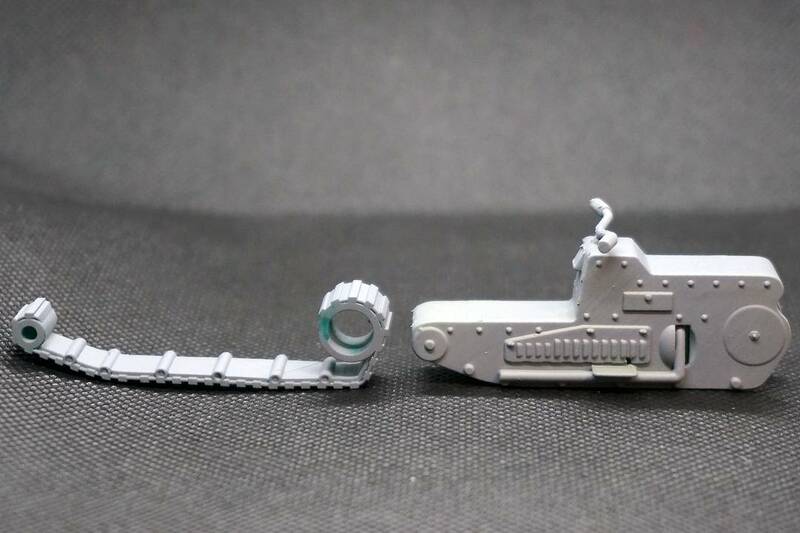 The finish on your model definitely makes the efforts by Shapeways pale in comparison. 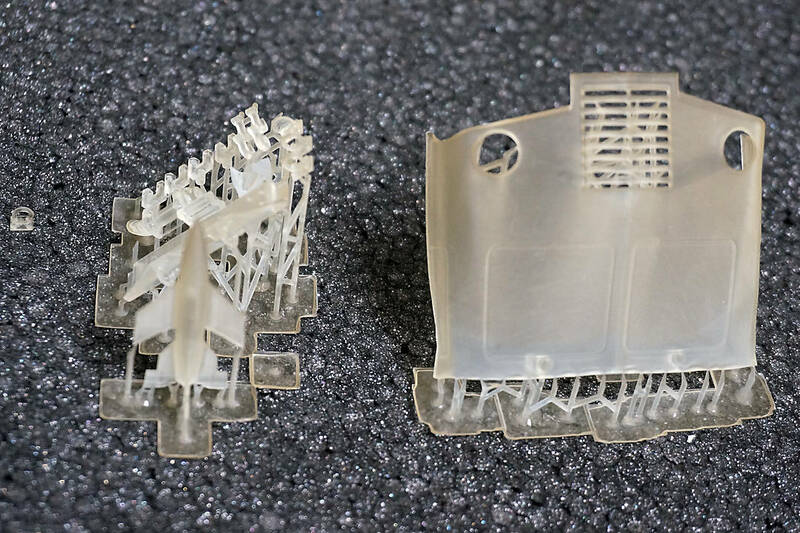 That's one of the best write-ups I've seen on 3D printing yet and I greatly appreciate how you went into detail about the differences between the types of printers. When you share this stuff with us it makes me feel lucky we've got such knowledgeable BtS members! Thanks guys. Next time I print something on the AnyCubic, I'll add something I've had printed at Shapeways, for a direct comparison. 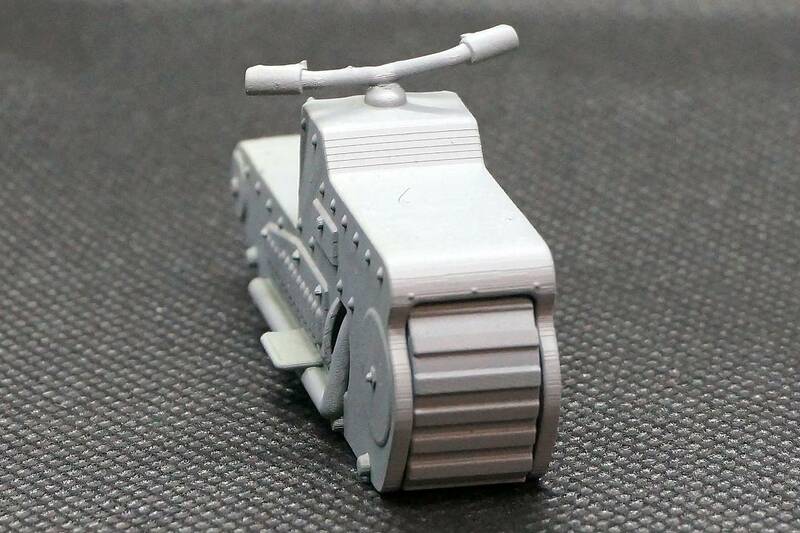 Can't afford a 3D printer at the moment so reviews like this start me drooling. I removed the tracked cycle from the supports, trimmed off excess supports where possible and gave it a coat of primer - no other processing was done, including no sanding. The horizontal lines shouldn't be there. The handlebars got knocked off, I glued them back on but the angle is off. The rider's seat and rear has a strange surface texture. Part of it turns out to be small rivets - the bigger "rivets" are attachment points that need to be cleaned off. Considering that this is only the second model I've printed so far (other than the default test cube) I think the results are outstanding. 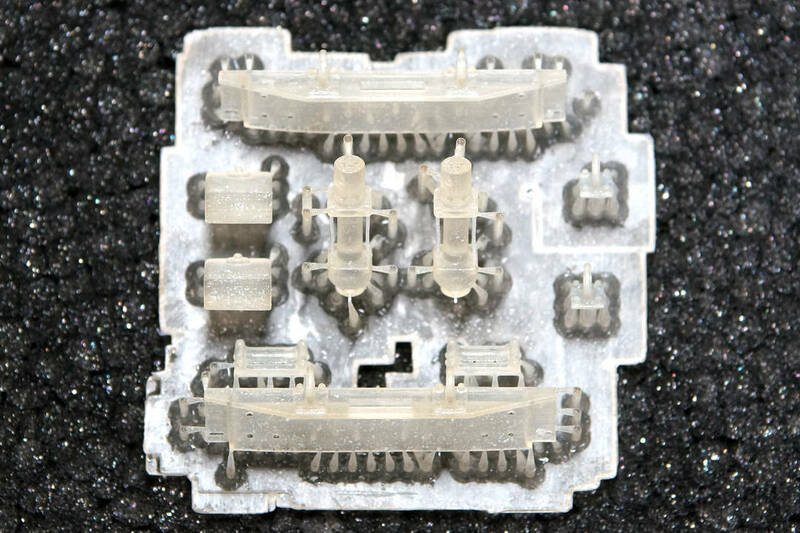 You can't get a similar surface finish "out of the bag" from Shapeways - at least not until they introduce their X Carbon printer (maybe). 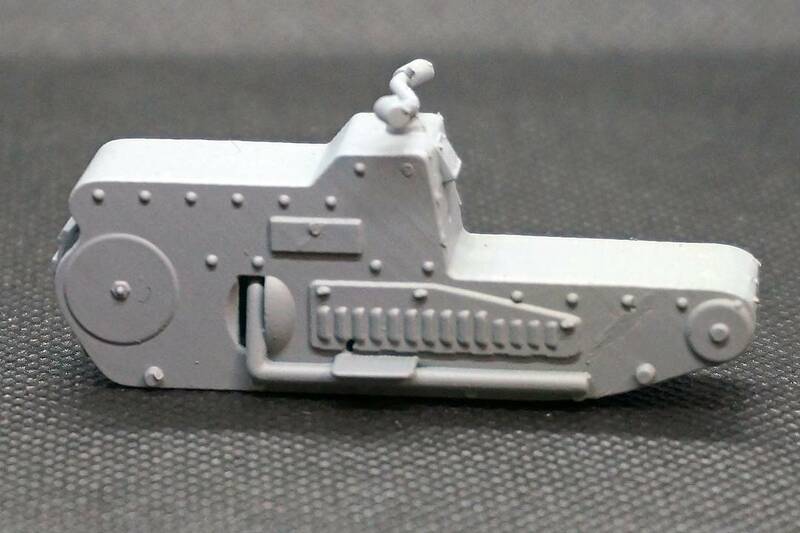 Their previous SLA printer option (no longer offered) was printing at a lower resolution, so it had more artifacts. Those are indeed outstanding results, Frank! I can't get over how smooth it appears. Unlike any 3D printing I've ever seen first hand. Now you've made me drool even more! Thanks guys - I just saw that Monoprice is coming out with a printer with similar specs (slightly lower layer resolution) for $300. So it is getting more affordable. I was impressed because this is my second print, and this model wasn't optimized for this printer. I think I'll get better results with more careful support placement and orientation. One option - other than buying a printer like this - is to go to a place like Makexyz, 3DHubs and find someone with an SLA printer like this. Both companies use local independent printers, and are available worldwide. Of course, printing is only part of the process - you need to make the object first, or get a pre-made one. I tried my third print today (second with objects I've designed), this time with clear resin. 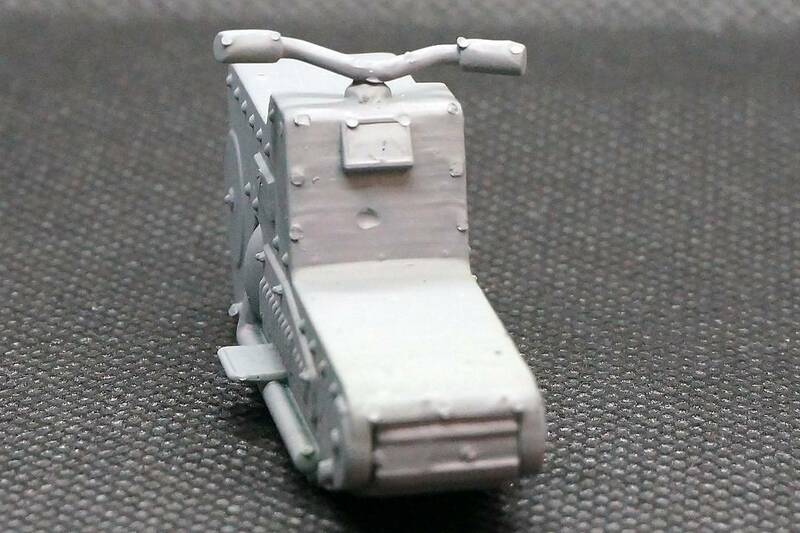 The subjects are the front end of the Morris-Ford Quad Commercial, a "scratch built" (or "scratch drawn"? 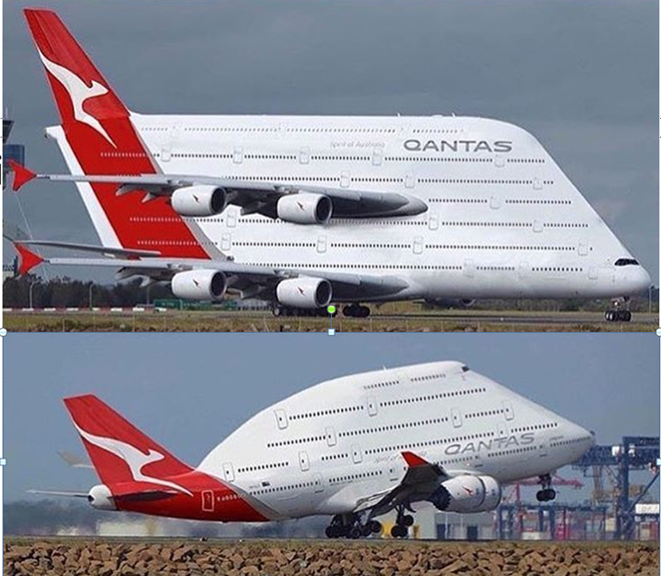 drawn from blueprints?) 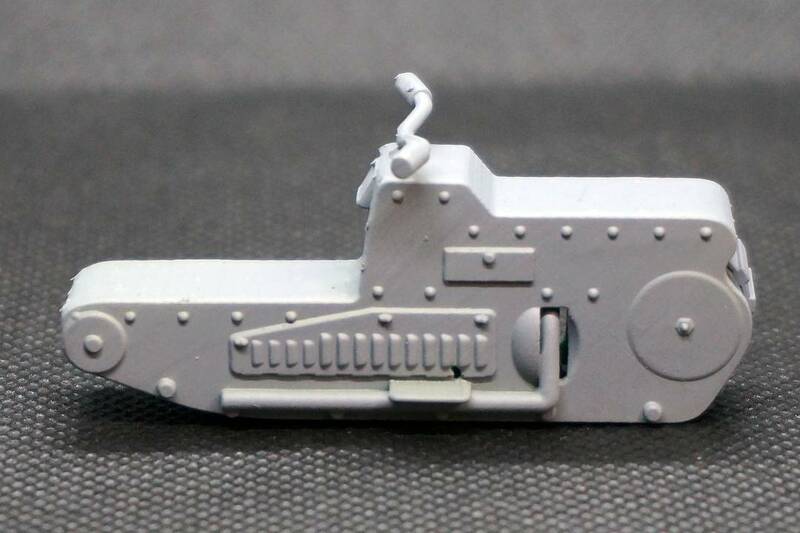 Warn winch for a Land Rover Series III in 1/35 and an A-4 rocket in 1/350, to compare with one printed at Shapeways. Overall, the results are encouraging and most of the issues will be resolved with more supports. This is everything printed. It was clear out of the printer and it yellowed as it cured under the UV lamp. What's amazing is how quickly it yellowed in the UV coming into the room from a skylight. The windows are foggy. I applied some Future to see if it helps. If it doesn't, I'll just take them out in the next print. 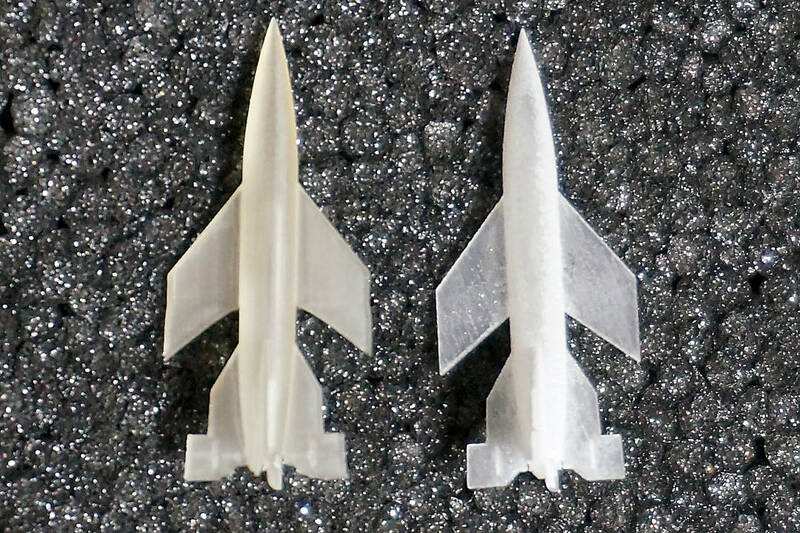 The Photon results are as good as (or slightly better) than the Shapeways results in Smooth Fine Detail plastic. The main error is that I didn't add supports to the middle of the wingtips, so they have a slight wave. Easy fix. I think the Photon, printing at 25 microns will be superior to the smoothest fine detail. Here's the winch. The motor end failed and the support has a wavy edge, but I'll fix that in the next print. Look at those hooks though - absolutely perfect! The bolt heads came out great, too. The small bolts also have washers under them. 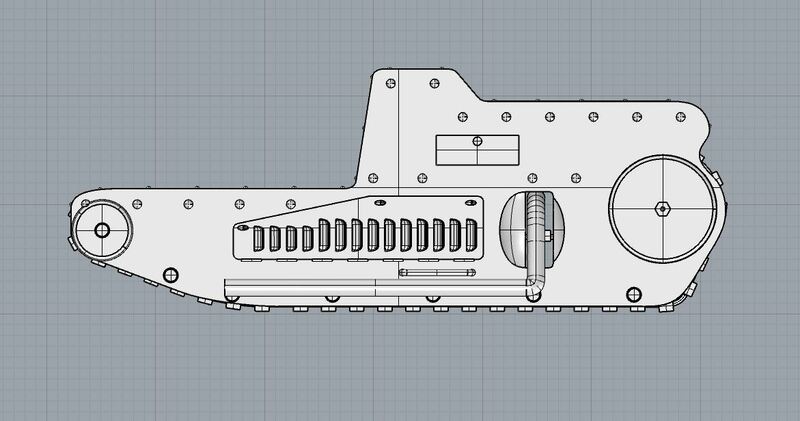 I think this printer is going to get a workout - I ordered a part that should greatly increase the accuracy of the Z (vertical) axis, which should produce even better print quality. Looking good. Pity you can't print perfectly clear parts for canopies etc. That was my hope. Maybe printing transparencies extra thin (the part above was 1.2mm thick) would help. Also, I can use the same clear resin as a "paint" and paint it over the transparencies to smooth out any printing artifacts, then blast it with UV. Unfortunately, with this resin, the results will still be yellowish. The thin rods connecting the two ends of the winch motor are 0.43mm in diameter. It's a bit fizzy because it's still wet from a wash. The small white dots are bits of cured resin from the alcohol bath - trying to extend the life of the washing alcohol, I put it under a UV lamp all all the uncured resin precipitated as a fine white particulate. When I washed this print, the particles landed on it. They're fairly easy to remove. The bolts are 0.26mm in diameter, the washers under them (difficult to see in this picture) are 0.43mm in diameter. It'll be fun putting this together.